In 1968, Time Out was created at a London kitchen table. A magazine packed with the best things to do in the city – from art, film and gigs to theatre and reviews of restaurants serving ‘rabbit food’ – Time Out was something never seen before. It was set to change city life. Fifty years on, Time Out is a global media and entertainment brand curating the best things to do in 315 cities in 58 countries, influencing how tens of millions of people go out around the world. A lot has changed, but Time Out’s mission remains the same today as when it first started: to be the trusted go-to source for information on the best of the city. Time Out’s high-quality content, curated by expert journalists, is no longer only found in magazines. It now spans a global network of websites, mobile apps, social-media channels, magazines, live events and Time Out Market, the world’s first food and cultural market based on editorial curation. Time Out Market Lisbon opened in 2014 and is now Portugal’s most popular attraction; by the end of 2019, five new markets are set to open in Miami, New York, Boston, Chicago and Montreal. To mark its 50th anniversary, Time Out will throw a huge party in Granary Square, King’s Cross, in London on 29th September, celebrating the best of the city right now. Tickets are available now from £30 at timeout.com/50. There will be dedicated content across Time Out channels all over the world, an exhibition at London’s Museum of Brands from 12th September and a book – both titled Time Out 50: 50 Years, 50 Covers – charting how Time Out has become an inseparable part of global city life. “I started Time Out in 1968 because it was hard to find out where to go and decide what to do in London: there was not one single place to find the information. So I effectively created a publication for myself. What we published was a package: it wasn’t just arts and culture and it wasn’t just politics, and that was one of the reasons people responded so well to it. We covered what didn’t appear in the mainstream press. 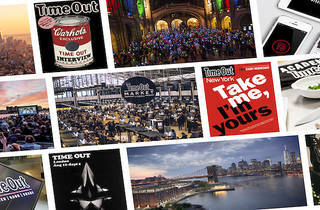 “Time Out started as a magazine in London and has expanded across the world. It is now the leading global media and entertainment brand and we inspire people to make the most of the city. What makes Time Out unique is our high-quality content curated by expert journalists and we are proud to have influenced generations all over the world to go out better. 1968: Fascinated by the atmosphere of ’60s London and wanting to help people explore the exciting new urban culture that had transformed the city, Tony Elliott – a 21-year-old student – created Time Out London, partly funded by a £70 birthday gift from his aunt. Sold for a shilling and pocket-sized, printed on an A2 sheet and folded down to A5, the first magazine had a circulation of 5,000 and was the equivalent of eight pages of today’s Time Out. Packed with the city’s counterculture, which was in full swing at the time, it was an insider’s guide to getting the best out of London. On the cover: an image from an Institute of Contemporary Arts exhibition. 1969: It didn’t take long for Time Out to become the go-to magazine to reach an engaged, culturally savvy audience. Marc Bolan of T. Rex fame dropped by the office to take out a full-page advert for his book of poetry, and after that popped in often to see how things were going. In the same year, Time Out reached a circulation of 10,000 and went from being published every three weeks to every two. 1970: The Time Out logo was knocked up by designer Pearce Marchbank one Sunday afternoon to look like writing on a window. Intended as a stopgap, it has lasted for 48 years with only minor tweaks. 1971: Time Out went weekly and has been published in London every week since, for 47 years, with just one interruption: a four-month-long strike by unionised staff in 1981. As circulation and advertising built, Time Out produced bigger magazines and the content evolved, reflecting how city life was changing. The publication became more journalistic in the ’70s, covering topics such as the Angry Brigade, minority and LGBT+ rights and the Troubles in Northern Ireland. 1971: Time Out scored an exclusive interview with Andy Warhol and 1972 (when circulation reached 30,000) saw the first of ten David Bowie Time Out covers – a record equalled by no other cover star. 1973: Time Out has always been dedicated to outstanding graphic design – a dedication most visible in its magazine covers, which are characterised by simplicity and originality. A great example was a 1973 cover by long-serving designer Pearce Marchbank with just one word, set on green: ‘Jealousy’. 1973: Time Out’s first and most surreal guest editors were legendary British comic troupe Monty Python. Spoof adverts and listings injected their irreverent humour throughout the magazine, which featured on its cover the distinctive cut-out visuals of Python animator Terry Gilliam. 1976: Time Out mostly failed to cover London’s exploding punk scene. 1977: Writers Duncan Campbell and Crispin Aubrey were arrested by Special Branch officers after interviewing a GCHQ whistleblower. Later, in 1980, police marksmen raided the Time Out offices with a helicopter in tow, after staffers took to the roof for a photoshoot with balaclavas and replica guns to demonstrate how realistic they were. 1979: Time Out was the first non-gay UK publication to give a cover to an LGBT+ issue, with a big pink triangle and the headline ‘A mark of oppression becomes a badge of pride – London celebrates a decade of Gay Liberation’. 1980: One of the few times in Time Out history that a cover was pulled at a moment’s notice was when John Lennon was assassinated and the team put together a tribute piece over the weekend. 1982: When Lou Stein’s stage production of ‘Fear and Loathing in Las Vegas’ opened in London, Time Out commissioned Hunter S Thompson himself to write a story. But the writer went on a bender at Time Out’s expense and his story (dictated into a cassette recorder) was inaudible. Thompson’s old partner in crime, artist Ralph Steadman, ended up writing the feature as well as designing the cover. 1982: Time Out’s first comprehensive TV listings appeared, following the launch of Channel 4, and were immediately injuncted by copyright holders as listings were owned by the duopoly of Radio Times and TV Times. Time Out went to court in 1983 and launched a campaign to fight for its right to publish TV listings – the campaign succeeded when, in 1990, TV listings were finally deregulated. In the hedonistic ’80s, a Nightlife section was introduced and many stories reflect how Time Out captured this glitzy decade. In 1984, Time Out scored an exclusive interview with Al Pacino. And Jack Nicholson said in an interview: ‘I’m pleased to talk to Time Out again. You seem to take the film seriously and don’t just ask me dumb questions about the size of my belly.’ In 1986, George Michael sued Time Out for reneging on a promise to put him on the cover. And in 1989, Madonna took Time Out on a night on the razz with Sean Penn and Donald Trump, ringside at the Tyson/Spinks fight. 1990: Long-serving Time Out art critic Sarah Kent interviewed an unknown artist named Damien Hirst. Five years later, she landed the first press interview with another unknown: Tracey Emin. 1992: Previously on good terms with Time Out, Robert De Niro said to writer Stuart Jeffries when he implied that the actor was spreading himself too thinly: ‘Time Out’s a f***ing a***ole magazine’*. 1994: An issue featured the cover line ‘The highs and lows of drugs’ and an in-depth look at the subject. Art director Jeremy Leslie said this was ‘the only time I managed to claim drugs on expenses’. 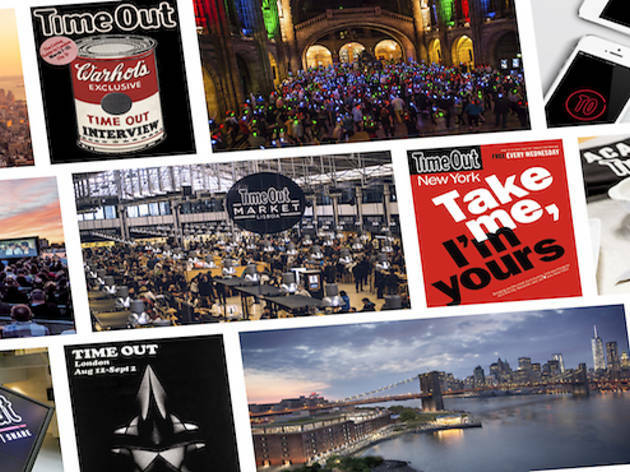 1995: Time Out New York launched – an overnight success that proved that the brand could travel. The year not only kicked off the brand’s global expansion but saw the launch of the first Time Out website. It turned out that Time Out content was perfect for the online era. Today, there are over 100 Time Out sites for the world’s most exciting cities, attracting 22.6 million unique visitors a month. 1995: Prince rarely gave interviews but made an exception for Time Out at a time when he was called the ‘Artist Formerly Known as Prince’. No photos, tape recorder or notebook were permitted, so interviewer Pete Paphides frantically scribbled down his remarks straight after. 1996: Time Out interviewed an unknown pop group called the Spice Girls. 1997: Time Out sponsored the controversial ‘Sensation’ exhibition of Young British Artists at the Royal Academy of Arts in London. 1999: Julian Rhind-Tutt played a Time Out writer in ‘Notting Hill’ alongside Hugh Grant. Over the years, major artists have taken over Time Out’s cover including Gilbert & George, Tracey Emin, Grayson Perry, David Shrigley, the Chapman Brothers and Banksy. 2001: Istanbul was the first city to launch as a franchise partner, followed by Dubai, Russia, Israel, China and Australia, with local entrepreneurs who all wanted to start Time Out in their own cities. A licensing system was developed to further expand the brand globally, working with local experts. 2004: Time Out New York launched its first Kids magazine, later successfully replicated in London. 2007: A Time Out New York cover declared ‘The hipster must die!’. 2009: Launch of the first Time Out iPhone app, paving the way to grow the brand via mobile channels. 2010: Time Out’s e-commerce platform launched, allowing users to not just read about but book the best city experiences. In 2017, 837,000 items were sold via e-commerce. 2012: The paid magazine circulation was declining and it was decided to make Time Out London a free weekly magazine, distributed at Underground and National Rail stations. The circulation went from 52,000 a week to 306,000, making it London’s most widely read free magazine. This success prompted NY, Chicago, Miami, Barcelona, Hong Kong and more to adopt the free distribution model. 2014: Time Out Market Lisbon opened – a physical representation of Time Out, bringing the best of the city’s restaurants, bars and cultural experiences together under one roof. Three Time Out Market chefs have Michelin stars in their own restaurants, testament to the high-quality food Time Out Market offers. 2015: Acquisition of the Time Out Portugal franchise. 2016: Time Out Group got listed on London's AIM stock exchange, trading under the ticker symbol ‘TMO’, to raise investment for future growth – led by Julio Bruno, Time Out Group CEO. As part of the admission process, the Group bought Time Out Market Limited to roll the format out globally. 2017: Time Out put on 791 live events for 155,000 attendees (such as Movies on the River and Battle of the Burger) and Time Out Market Lisbon saw a record 3.6 million visitors. This was also the year of the Group’s further global expansion, with the acquisition of Time Out franchisees in Australia and Spain and the addition, at no cost, of Hong Kong, Singapore and Seoul into its owned and operated network. While the majority of the Group’s revenue is now digital, print continues to be important to reach a highly engaged audience: as of 2018, Time Out magazines are available in over 40 cities with the most recent launching in Paris, demonstrating the success the brand enjoys in both the print and digital arenas. Following the success of Time Out Market Lisbon, the format is being rolled out globally to drive further growth and diversification. By the end of 2019, markets are set to open in Miami, New York, Boston, Chicago and Montreal and the Group continues to scope new locations around the world.